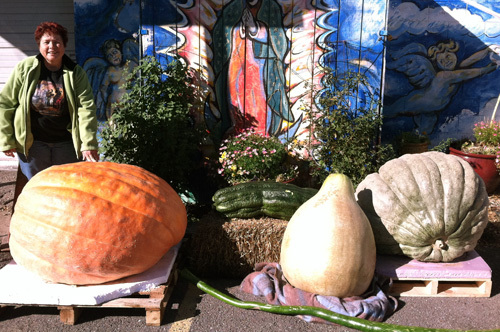 4 New Mexico Giant Vegetable State Records Set in 2011!!!! 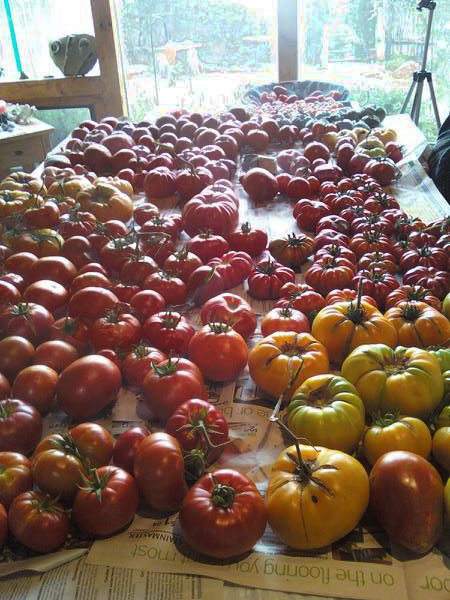 Four New Mexico Giant Vegetable State Records Set yesterday! Yesterday I set 2 NEW New Mexico Records and BROKE 2 New Mexico Records that I set last year! My giant pumpkin, ‘Max’, ended up officially at 448 lbs breaking Kong’s record of 421 lbs last year. My giant marrow, ‘King Zuc II’ (zucchini) was 62 lbs which broke last year record of 43.5 lbs. My giant green squash, ‘Kryptonite’ (greenie) set a new record of 340 lbs and my long gourd, ‘Jake the Snake’, set a new record of 80″ in length. My giant pear gourd, ‘Gourdo’, weighed in at 103 lbs which was one lb more than the one at the State Fair earlier in September but there is no category for it. Sorry it took so long to post this but we had to get back from Colorado and get the guys back to unload all the giants at our studio! The next two posts will show the loading and Weigh-off but I wanted to get this out for all you following! Weigh-Off time is upon us! The crew-from left Spooner, Ed, Per, Ira, me, Javier, Daniel, and Beto-THE KONG BOYS! The weigh-off is almost upon us. Tomorrow the pumpkin/greenie squashes will be cut at 8 am and loaded in the truck on pallets. How do I get all this weight in the bed of a truck? 8 strong men! These guys are the best and nicest guys around and I REALLY appreciate their help. I couldn’t do it without them. 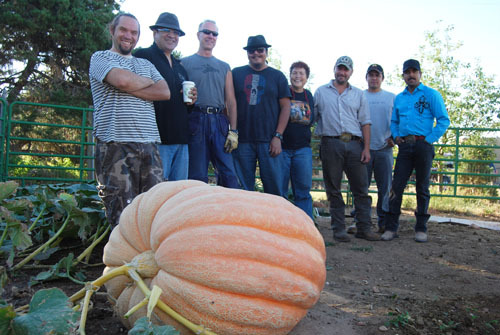 Here are last year’s crew with my giant pumpkin, ‘Kong’ at 421 lbs. This year’s giant pumpkin, MAD MAX is 463 lbs and the ‘Greenie’ squash, Jabba the Hut is 347 lbs.! Hope the guys have been working out! More pics tomorrow of the loading of the giants! Today MAD MAX (according to the tape measurements) reached 463 lbs. That’s 42 lbs over last year’s record of 421 lbs! Remember it could weigh lighter than the charts, but I feel pretty good that it will now beat the old record. It has to be all the extra water it’s been getting this past week. Over 2.2 inches in the pumpkin patch! Simply wonderful. That plus it’s been getting some extra fertilizer (seaweed and fish emulsion) right now. Pump it up MAXIE! The weather has been challenging but it hasn’t gotten down to 32°F (0°C) yet in the patch . It was suppose to but I’ve truly LUCKED OUT! I have the pumpkin plant covered with row cover and of course MAX has been covered for a month now with blankets at night. Now if it can just get through tonight, I think the rest of the week is suppose to be warmer and then it’s off to the races on Saturday! Meanwhile the greenies are getting scary! That’s scaary good! Jabba is 349 lbs and Kyrptonite is 341 lbs! They are still battling it out for who gets to go! I hope one of them will actually sit on the mini pallet I picked up! 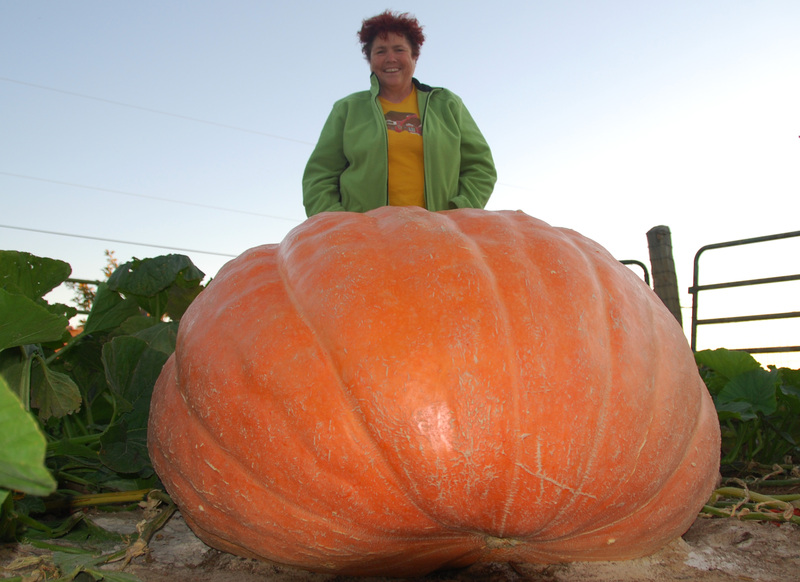 The other giants going to the weigh-off (if there is space) is a long gourd at 79″. It doesn’t weigh much but may have to hang off the truck. We’ll put a red bandana off the end of it! LOL. There is also a giant marrow (zucchini). I can use as a spacer between the pumpkin and greenie! And a giant pear gourd-ah what’s another 100 lbs! It should fit in the corner! Greenies battle it out for who will go to the weigh-off! JABBA THE HUT is leading the greenies at 329 lbs while Kryptonite is close behind at 318 lbs! JABBA is called a ‘bird bath’ because it’s belly button is sitting on top of the squash instead of on the side which is more common. 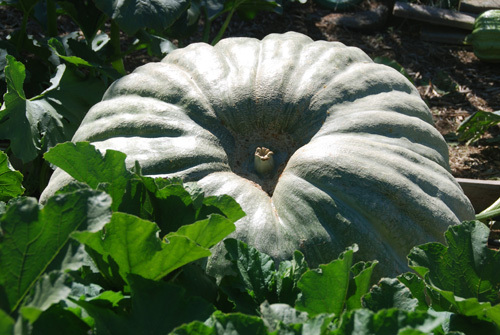 We will go to the OCt 15th weigh-off in Colorado Springs to let the squashes gain as much as possible. I hope there will be no freeze or snow to kill the plants before then-it will be close. I read that they can continue to grow about 1 week after a hard frost and then you just try to keep the pumpkins from losing weight before the weigh-off. It looks like it will be 33°F on Saturday. I’ll have to cover MAX and the Greenie plants with some protective row cover material. I don’t know how heavy the biggest marrow (zucchini) is yet. I will cut all 4 big ones before we go up and take the heaviest. I do know they are all over 43.5 lbs which was the smallest one I took to the State Fair. The long gourd is currently 79 inches long and I have a ‘baby’ one growing that is 50 inches long and gaining fast as well! I’m not sure how big the Giant Pear Gourd is but I think it is close in size to the one I took to the fair which weighed in at 102 lbs. 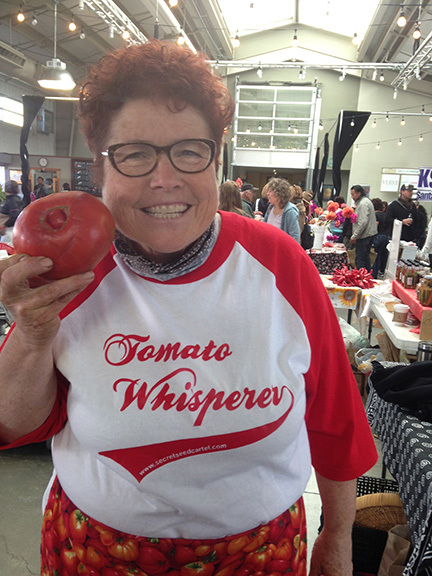 NM State Fair Results for my Giant Veggies!